In the past 30 years, the incidence of thyroid cancer in Victorian women has tripled according to Cancer Council Victoria statistics. While the ever-rising numbers fortunately haven’t affected mortality rates, they are placing an added burden on the state’s healthcare system. Dr Michael Mond, who co-leads thyroid cancer clinics at Monash Health and Eastern Health tells us about the latest treatment. With the sharp rise in incidence, the situation is placing increased stress on both patients and clinicians, who in up to 30 per cent of cases cannot be sure if a thyroid nodule is benign or malignant. 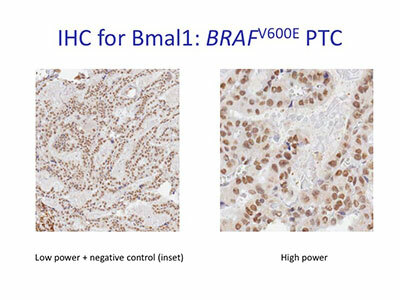 This immunohistochemistry slide shows staining in epithelial cells for BMAL1. However a project by Monash Partners aims to reduce that uncertainty by developing a more reliable method of detecting genetic changes that can occur in thyroid nodules. The nodules are abnormal growths of thyroid gland cells that form a lump within the thyroid gland. In the vast majority of cases they are benign growths, but current methods of detection have their limitations, says Dr Mond. “Ultrasound features can be a guide as to which nodules are potentially suspicious but no single feature is entirely reliable and it remains a challenge to know which ones are malignant,” he says. When a thyroid nodule or lymph nodes appears suspicious, fine needle aspiration – where a small number of cells are taken out of the nodule via a biopsy – is usually used to investigate further. However in up to 30 per cent of cases, this does not give a definitive answer, leaving the patient and clinician in a position of uncertainty, says Dr Mond. In some cases, patients will opt to remain under observation; in others they’ll proceed directly, and often unnecessarily, to surgery. The Monash Partners pilot study involves patients from Monash Health, Eastern Health, Alfred Health, Austin Health and the Peter MacCallum Cancer Centre. Dr Mond says the study has so far shown that by using relatively new technology – DNA and RNA gene panels – clinicians can reliably detect multiple mutations and gene rearrangements in a range of thyroid samples. “This is significantly more efficient than performing multiple tests for individual mutations and gives a more complete profile of the genetic make-up of tumours,” he says. Already, the results of mutation testing have begun to be incorporated into clinical records and discussions at Monash Health and other Monash Partner sites. Dr Mond says in a number of cases, that has provided clarification for a previously uncertain diagnosis, as well as helping clinicians tailor suitable treatment and follow-ups. Dr Mond says there are significant challenges in trying to apply the research findings to everyday practice, such as staffing levels and the high costs of tumour mutation testing. 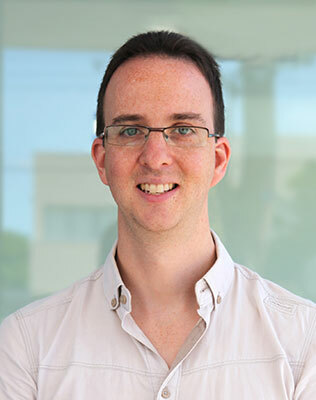 However the Monash Partners team is forming collaborations with other healthcare networks, with the aim of developing more affordable mutation testing with a rapid turnaround.